His Excellency said that there is no doubt that Syria is counting on Russia, primarily because of the historic relations between the two countries and because Russia is a superpower and a permanent Security Council member, pointing out that Syria played an important role since the first days of the crisis and that the two governments were communicating directly, with the Syrian government explaining to Russia the details of the situation based on Syria's importance and influence in terms of the situation in the Middle East and the region. "Russia knew the dangers of the attempts at foreign interference in Syria, thus Russia played an important role in the international arena, with the most recent action in this regard being the Russian veto at the Security Council," he said, adding that Syria is counting on the Russian stance and continuing support not just in defense of Syria, but also in defense of worldwide stability. In response to a question on a Communist opposition figure thanking Russia for its veto while others burned Russian flags in Syrian cities, President Al-Assad said regarding the first point that any Syrian citizen would have the same response as anyone with the least amount of patriotism would be grateful for Russia's stance at the Security Council, adding that being in the opposition or a loyalist or somewhere in between doesn't mean differing in political issues, as there is no difference in opinion with the opposition regarding Syria's sovereignty and rejection of foreign interference and confronting terrorism; the differences lie in internal issues and political, economic, cultural and other issues. "Regarding the burning of flags, I don't believe we can put that in the frame of political work as it doesn't represent opposition or anything else. It often represents individual cases that may be spurred from abroad to complete the media image of the big lie being promoted about Syria in foreign media, showing Russia as if it supports a state against the people… this is the supposed media game behind this action," President Al-Assad pointed out. On the subject of who is represented by the opposition, President Al-Assad said that such an issue would be more accurate after elections and the emergence of new parties, which would decide which sections of the society the opposition represents. 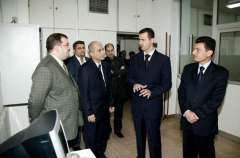 "We're dealing with everyone; with all the forces on the Syrian arena because we believe that communication with these forces is very important, without specifying who has a popular base and who doesn’t," President Al-Assad said, stressing that a more accurate answer can be given after the elections which should take place in February 2012. Answering a question on national dialogue, organizing elections and the establishment of a council in Istanbul by the opposition with their unwillingness to hold negotiations with the authorities, and whether there is a way to reach a peaceful agreement with them, President Al-Assad said "The first thing is that in order to hold a dialogue you need more than one side, the other side should be able to hold dialogue… The other thing is that in order to hold political or formal dialogue with a side, there must be bases from which to start." 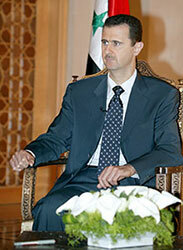 President Al-Assad asked "Are the forces we are willing to hold dialogue with accepted by the Syrian people? Are they manufactured abroad? Do they call for or accept foreign interference? Do they support terrorism? When we define all these bases, we can decide whether we hold dialogue or not." His Excellency stressed that the Syrian people reject foreign interference and oppose anything which come from outside the country, be it a political issue or stance. "About the council that was formed in Istanbul, I don't know a lot about it, but I can say that the accurate answer of this question comes from the Syrian people. When the Syrian people accept a council or a particular political structure, we as a state should hold dialogue with it," President Al-Assad indicated. "As for the principle of accepting or rejecting dialogue or heading toward violence, I think the proper principle is adopting dialogue because it leads to solutions that stabilize any country. That is why we don't comment a lot on that council, because the Syrian people didn't care about it… When the Syrians consider a thing, the Syrian government will, subsequently, take it into consideration," President Al-Assad added. On whether Syria will remain strong in the face of the economic sanctions imposed by the west and the US and regarding the Russian aid in this matter, President Al-Assad pointed out that this siege, and particularly the economic and technical blockade, on Syria is decades old and isn't new, saying "I don't recall any period in which there wasn't some sort of western blockade on Syria, but this blockade intensifies during crises, which is why we decided six years ago – in 2005 – to head towards the east." President Al-Assad pointed out that the western sanctions and blockade primarily harm the Syrian people, not the state, but they will not smother Syria which relies on its own products and exports. 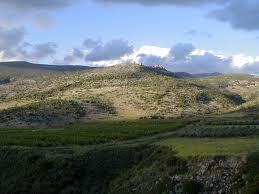 "Syria has food and industrial production in addition to many other domains. As for the other materials that are not produced in Syria, we have neighboring countries. We are capable of overcoming this blockade by adjusting to the new status, which we'd already adjusted to in previous circumstances," he elaborated. About heading eastwards, President Al-Assad said that Syria had always has relations with the west during recent decades despite the fact that the west, particularly France and the UK, was occupying a part of the east. On the attempt of Syria's enemies to repeat the Libyan scenario in Syria and the Syrian plan to prevent that, President Al-Assad said that Syria is different geographically, demographically, politically and historically from Libya, adding that such a scenario will be unviable and of exorbitant cost. "First, a media was used to forge an external state against Syria, especially in the Security Council. At that time, we were focusing on the internal aspect because it was not easy to show that there was an external plot, even to some Syrians. It was not easy to show that there were armed operations perpetrated against the state. 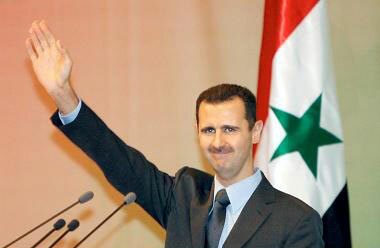 Now, we have hundreds of army soldiers, policemen and security personnel killed," President Al-Assad said. 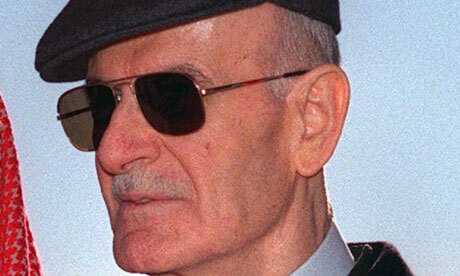 President Al-Assad asked "Were they killed through peaceful protests? Were they killed by the shouting during the protests? Or were they killed by weapons? So, we're are dealing with armed people, now the matter is clear and the Syrian people are now aware of the reality of the events in Syria. "In the last two months, we've begun to focus on the external media, we've invited a large number of mass media establishments to come to Syria and inspect the reality of the events. The western media channels are biased in general not only during crises; they have a wrong preconceived notion and sometimes they express political agendas concerning the region," President Al-Assad said. President Al-Assad pointed out that "We are now trying to bring western media to inspect the reality but we are focusing on the friendly media to enable them to inspect and convey the image to their public in order for their governments to be able to take supportive stances regarding Syria. I think the basic direction now is towards media; we have to unmask the external plot against Syria, and at the same time help these countries in aiding the local media." 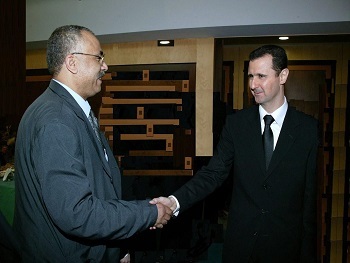 On whether there are sides assisting Syria's enemies and the amount and sources of weapons at the disposal of these enemies, President Al-Assad pointed out that during the first few months and particularly the first month of the crisis, it was difficult to find out the reality of what was happening and where the money or weapons was coming from, or even if there were actually money and weapons. "After more than seven months since the crisis in Syria began, we gathered clean but incomplete information, but through recent investigations with terrorist it became irrefutably clear that weapons were being smuggled across the Syrian borders from neighboring countries and funds are being sent from people abroad… We have information about people leading these operations outside Syria and in several countries. 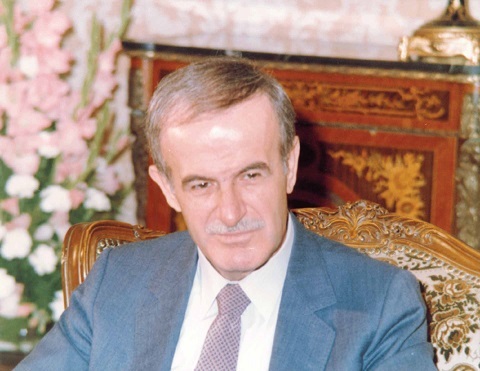 "We don't have precise information about these people's relations to countries, but it's perfectly clear from the quality and scale of weapons and the amounts of money that the funding isn't personal funding; rather there are countries behind this funding," President Al-Assad said, adding that specifying the countries responsible for this funding requires clearer information, at which point Syria's won't hesitate to uncover the facts. Regarding the source of weapons and ammunition, particularly Israeli explosives, President Al-Assad said that there are weapons from various countries including weapons of Israeli manufacture, but it's impossible to pinpoint if their source is Israel or another country that possesses such weapons. 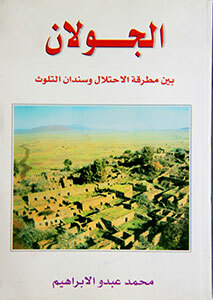 "There are bombs and mines placed in areas with civilians and may target civilians sometimes and they may target security forces or the police or the army… there are also-anti-tank weapons which is new and serious… so all things point to the fact that there are countries responsible for armament and not individuals who may actually be fronts for these countries. "Where do the weapons come from… from neighboring countries… despite that fact we cannot accuse them of being involved in the smuggling as it's difficult to control borders with surrounding countries, which applies in most countries around the world," President Al-Assad explained. His Excellency concluded by thanking the Russian channel, saying that he believes that this program will play an important role in relaying the reality to the Russian viewer about what is happening in the world and the Middle East, and specifically what is happening in Syria.